A look in any city’s phone book not only will show a wide range of church denominations and fellowships, but also a variety of worship styles. What is the same for each, however, is the centrality of worship in the life of a church. 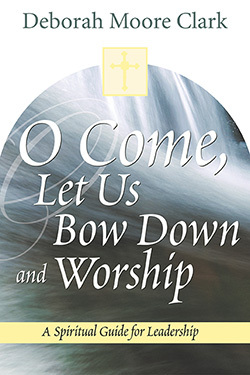 O Come, Let Us Bow Down and Worship asks and answers this question "Why worship?" Scriptural models for worship suggest implications for building or revitalizing worship services which address contemporary cultural issues, a church’s essential style, and the basic theology of worship. Numerous practical worship reforms are presented, including the principle of planning and the organization of the creative process. Deborah Moore Clark’s insights will prove to be an essential ingredient to any church which hopes to bring meaning and vitality to the practice of worship. Deborah Moore Clark is an ordained minister who worships with the Myers Park Baptist Church, Charlotte, NC, where she serves as a liturgist, deacon and Bible study leader. Vocationally, Deborah is active as a freelance musician, writer and public speaker. "Deborah Moore Clark treats worship with the level of seriousness appropriate for the most important ministry of the church. Inspirational and educational, visionary and practical, O Come, Let Us Bow Down and Worship questions, probes, praises, and criticizes, in an effort to heighten appreciation for worship and encourage more meaningful participation in worship." "This book is an overflowing treasure box of worship resources, a set of thoughtful reflections on worship. Its theology and its practice form a helpful guide for ministers and lay leaders on how to lead worship in a time of theological and cultural turbulence."